Antiqued Reproduction of Dickens' A Christmas Carol! Surfing the web for Christmas party ideas that are original? How about planning a Christmas party that everyone will remember for years to come! A Christmas Carol theme party! With this incredible download, you'll have all of the ideas you'll need to plan that Christmas party that everyone will be talking about on Monday morning! 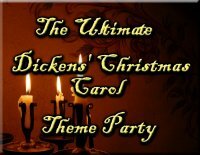 This incredible e-book has compiled OVER 100 unique and creative Dickens' Christmas Carol theme party ideas to make your party or event FANTASTIC! From the simple to the elaborate - but all creative! Compiled by a professional treasure hunt event designer with over 15 years experience in designing pirate themed parties and events! PLUS MORE! 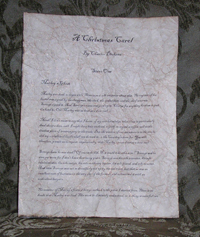 This e-book also includes some printable Dickens' Christmas Carol themed party game sheets! Print, copy and play! This comprehensive e-book is all meat & no fluff or fillers. OVER 30 PAGES of non-stop ideas, ideas and even more unique and creative Dickens' Christmas Carol theme party ideas! "Decorate a Christmas tree with a Christmas Carol theme"
"3. Create a Jacob Marley themed Christmas Tree! Using black or dark grey construction paper, create paper chains to fully cover the tree in a haphazard way (NOT in the traditional evenly draped fashion.) Place small, grey painted boxes also on the tree. Additional things to consider are rolled up scrolls (eviction notices), accounting ledger sheets, quills (pens) and spider webbing. For a GREAT effect, string on ALL PURPLE lights (these can be ordered from online suppliers who sell Halloween items year round.) A tree like this looks GREAT at your front entrance!" Imagine over 100 more ideas just like this! What do our customers have to say about our products? "I've never been disappointed by anything you've sent. Joe, I can tell you're creative and brilliant, and all your products have been fabulous. Thanks for your passion" Laura W.
"My experience with Quest was terrific. The treasure hunt I purchased was a great hit with the 13 children that participated. It was interesting, difficult, but not too difficult, and a lot of fun...I know I will go through Quest again..." Cindi C.
This download is offered in the convenient pdf Adobe Reader format. CLICK HERE TO DOWNLOAD THE ULTIMATE DICKENS CHRISTMAS PARTY NOW!